Despite Wednesday’s huge relief rally, crude oil prices remain as much as 38% lower compared to their peak in early October. This has brought immense comfort to India, a large importer of the commodity. 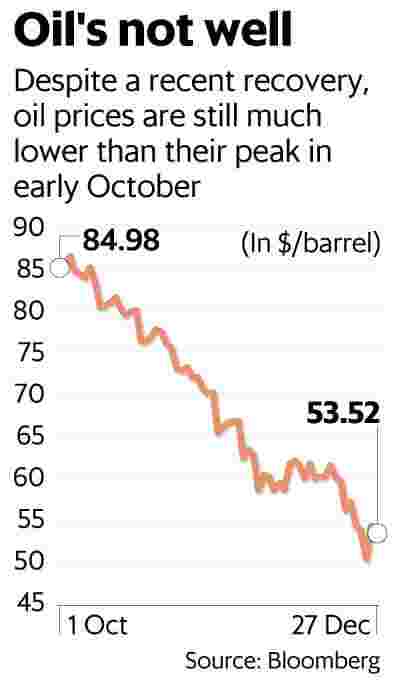 Brent crude prices are now at around $53.5 a barrel, down from $86 on 3 October. For some days now, oil markets have been under pressure driven by the broader weakness in financial markets. There are concerns on global economic growth. The US government shutdown and rising tensions between the US and China have made investors anxious. Besides, supply from the US has been be higher than expectations. Needless to say, oil prices will continue to feel the heat until the situation eases. The demand outlook isn’t spectacular. On the supply front, how production from the US shapes up would be critical. Starting January, crude oil production cuts from the Organisation of the Petroleum Exporting Countries and allies will come into play. While this is anticipated to support crude prices, the impact of output cuts are expected to reflect after some weeks. To be sure, there are upside risks to prices. Kotak Institutional Equities expects incremental global oil demand of 1.4 million barrels a day (mb/d) to be offset by non-Opec supply of 1.5 mn b/d. “However, a reduction in Iran’s oil production/exports from May 2019 in the event of US removing its exemptions to eight oil-importing countries from Iran may result in global oil supply falling below demand, leading to inventory drawdowns and higher global oil prices," said Kotak analysts in a 20 December report. Besides, in terms of the anxiety that has gripped broader financial markets, a breakthrough in the US-China tariff war could bring about a quick reversal, says Vandana Hari, founder, Vanda Insights. That would automatically prop up crude as well, she reckons. China is getting set for stimulus measures. Accordingly, investors would do well to watch China’s economic health, given that it is one of the largest oil importers. “So all-in, we may be in late-February or early March before confidence returns to financial and oil markets" says Hari. “Until the financial market turmoil continues, I expect Brent to remain range-bound around $55-65 a barrel," she reckons. As the volatility in recent trading sessions suggests, there are a fair number of unknowns, and things are expected to remain volatile until there is clarity on some of these issues.